If you are not into WordPress I’ll give you some context first: The “classic” editor in WordPress was replaced by something completely new. Project “Gutenberg” brings a “block based” editing experience to WordPress. I took an early version of the beta for a test drive back then (in June 2017). Right before Christmas Gutenberg was finally released and is now the default editor in WordPress. Changing a software interface that is used by millions every day for over 10 years, can only trigger negative comments at first. I have started using WordPress in 2005 and the core editor has been improved, but the look and feel, how you write and edit content, always stayed the same. The whole discussion brought back memories at my time at Microsoft, when classic toolbars and menus were replaced with “ribbons” in Office. The outcry of the community was huge. Users did not understand why a software element that worked for them for years suddenly needs to change. One of the most asked questions back then was how to get back the classic menus and toolbars. This is also a similarity to the editor change at WordPress. The classic editor plugin, which brings back the old editor in WordPress, is of course extremely popular right now. It seems, as a software development team working on such a project there is nothing to win at first. 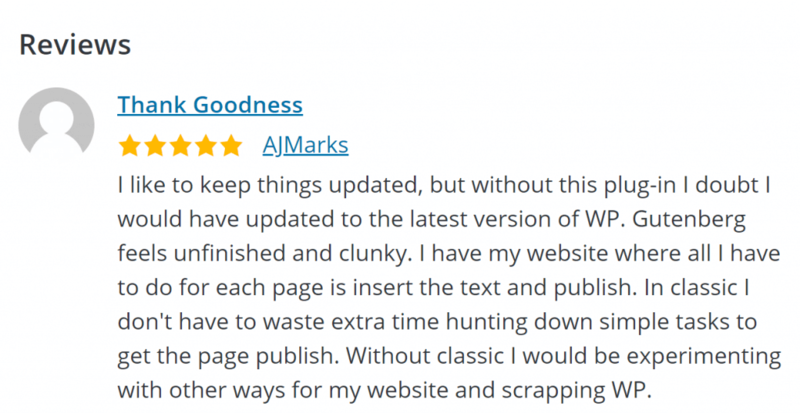 Just read the reviews on the classic editor plugin, or what Twitter has to say about #Gutenberg and #WordPress. But either way, a few months from now and users will have adapted. It’s not what Gutenberg is today but what it offers in the future. Projects like Stackable show what’s to come. Instead of themes installing their own visual editor (as Enfold does with Avvia Layout Editor), developers will create solutions based on Gutenberg, and that leads to a more standardized way of creating content in WordPress on the long run (I think..). Whats my verdict, after using Gutenberg for a few weeks and writing a few blogs here? The drag & drop of blocks does not work smoothly for me. Could be my browser or my machine, but its not “snappy”. Also, I want a keyboard shortcut to move blocks. You can learn more about the new editing experience on WordPress.org. I’ve switched to Ghost for my personal blog a while ago, and they introduced a block based editor a few months before Gutenberg was rolled out. I don’t mind it, but to be honest, my imagination at this point is too limited to see any real benefit. On the other hand, I can see how things can get complicated. E.g. I’ve worked with the Divi plugin, which brings its own block-based editor, and while seemingly easy to use, it can be a huge pain. Even if Gutenberg eliminates the need to use these types of third-party editors, I see huge potential for it to get even more complicated once other plugins try to add their own thing to Gutenberg. Good point. maybe the classic editor plugin will always be in favor by those writing simple blogs with text and a picture here and there. Gutenberg for sure has more sophisticated use cases in mind. Never used Ghost in a real world project, but after noticing a few “from ghost back to wordpress” blogs I got the impression its not for me. You know, Ghost is rather bare-bones and it takes a while to make sense of a couple of things (or to even get it to run if you’re unfamiliar with node.js). But it has an early days WordPress feel to it, and it’s actually very light-weight compared to WordPress. Which suits me fine for my personal blog, but is probably a deterrent for anyone setting up blogs for professional purposes.